The 2018 Billboard Music Awards, held at the MGM Grand Garden Arena in Las Vegas, celebrated some of music's biggest names on Sunday night. A slew of artists took the stage to perform throughout the night, including John Legend, Christina Aguilera, Demi Lovato, Ed Sheeran and Ariana Grande. The 2018 Billboard Music Awards paid tribute to the students and teachers affected by recent deadly shootings in Texas and Florida, while the night also featured show-stopping performances by iconic singer Janet Jackson and K-pop group BTS. Shawn Mendes and Khalid were joined onstage by the Marjory Stoneman Douglas Show Choir for the song “Youth,” a performance occurring three months after 17 people were killed at the school in Parkland, Florida. Mendes and the choir members wore sweaters that read “Youth,” while Khalid’s shirt read “Protect Our Guns Children” with “Guns” crossed out. The show wasn’t all somber though: Jackson rocked the Billboard Awards with an energetic and powerful performance of her past hits in an epic week that included her 52nd birthday and the 25th anniversary of her groundbreaking “janet.” album. In a glittery gold sweater-dress and thigh-high boots, Jackson sang “Nasty,” ″If” and “Throb” as audience members such as Ciara and Tyra Banks danced along at the MGM Grand Garden Arena in Las Vegas. Bruno Mars made a surprise appearance to introduce the singer, who earned the Icon Award. Jackson used her speech to pay tribute to powerful women. “Women have made it clear that we no longer will be controlled, manipulated or abused. I stand with those women and with those men equally outraged by discrimination who support us in heart and mind,” she said onstage. Another highlight came when BTS, who won top social artist Sunday night, performed onstage. Clarkson sported huge, puffy earmuffs as she introduced the K-pop group, who easily earned the loudest applause from the audience throughout the night. Whenever their name was mentioned, or when the camera panned to the band members, the audience erupted — some even holding fan made signs. The seven-member group danced slickly onstage as they sang “Fake Love,” the single from their album “Love Yourself: Tear,” released Friday. Ed Sheeran, who didn’t attend the show but performed from Dublin, won the night’s biggest honor — top artist — besting Mars, Drake, Kendrick Lamar and Taylor Swift. “Thank you for making me feel understood again,” Swift said to her fans. 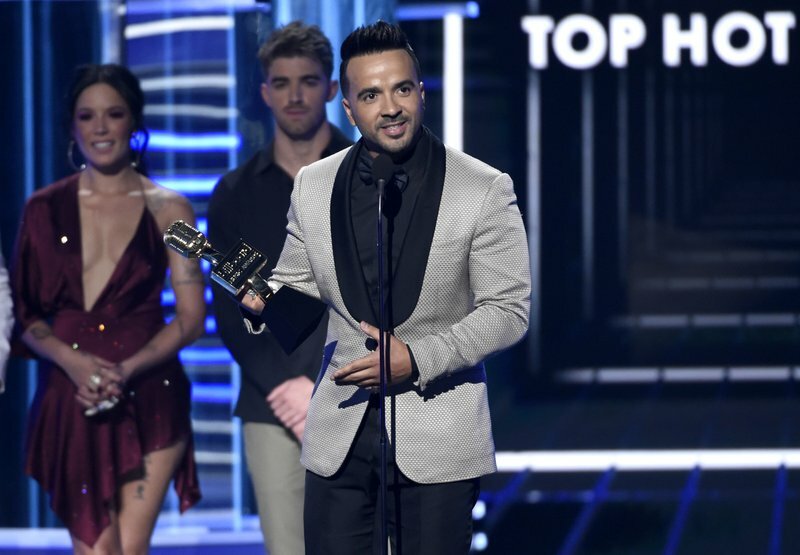 Luis Fonsi was passionate when he picked up top Hot 100 song for “Despacito,” the biggest hit of the last year which also included Daddy Yankee and Justin Bieber. Before presenting the award to Fonsi, the Chainsmokers and Halsey remembered Avicii, the DJ-producer who died last month at age 28. The Chainsmokers also paid tribute to Avicii when the duo won top dance/electronic artist. Camila Cabello won the chart achievement award and also won over the crowd with her performance of “Havana,” as audience members Mila Kunis and Rebel Wilson sang along and danced happily. Cabello’s former Fifth harmony bandmate, Normani, was fierce as she performed “Love Lies” alongside Khalid; Grande followed Clarkson’s emotional words with an energetic performance of “No Tears Left to Cry”; and John Legend’s performance ended with a photo of his new baby boy displayed on the large screens at the arena. Salt-N-Pepa closed the show with high-energy, performing the hits “Push It” and “Whatta Man” alongside R&B group En Vogue and even Clarkson. 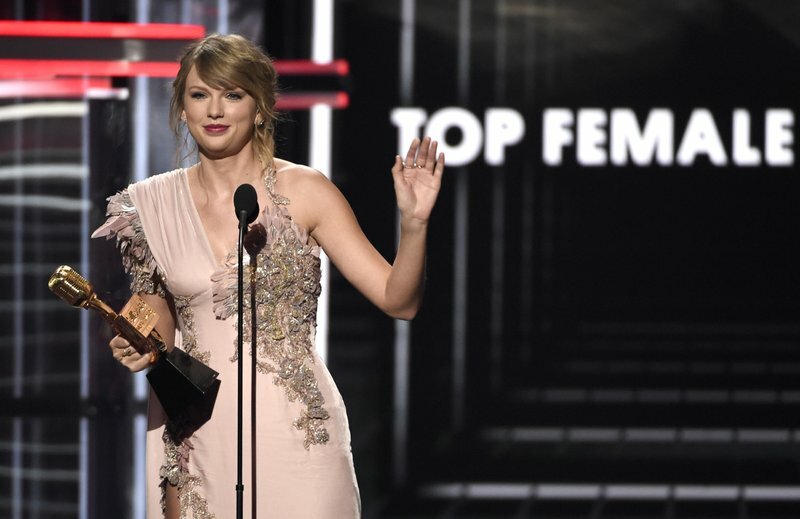 A list of winners in the top categories at the 2018 Billboard Music Awards, held Sunday at the MGM Grand Garden Arena in Las Vegas.